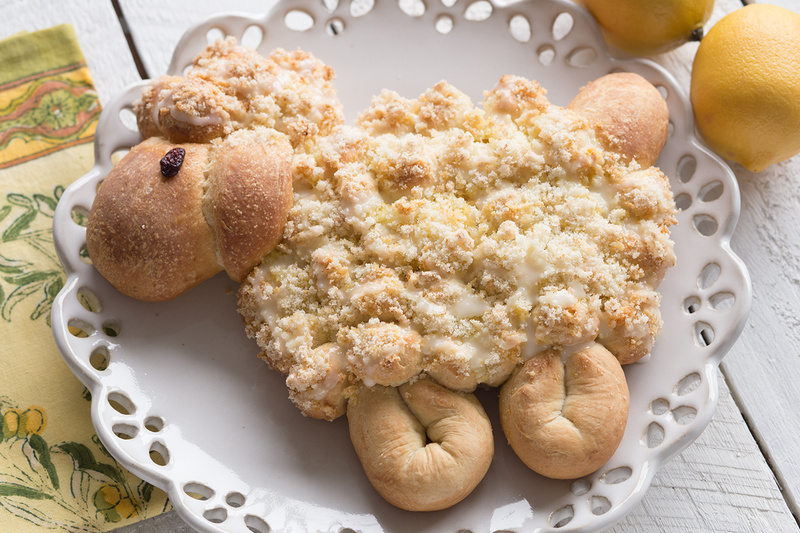 This delicious lemon pull-apart lamb is the perfect way to usher in the spring season. Shape one roll into an oval for the head and place on a sprayed baking sheet. Cut 6 rolls into sixths and arrange for body and top of head. Cut one roll in half and shape one half for ear and other half for tail. Place on body. Cut last roll in half and roll each piece into a 4-5 inch rope. Fold in half and place under the body for legs. Brush entire lamb with half of the melted butter. Cover with sprayed plastic wrap and let rise 30-45 minutes. 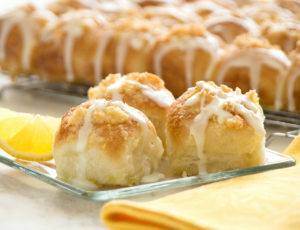 Mix remaining melted butter with lemon juice. Mix lemon zest with sugar. Remove wrap and brush the entire lamb with the butter and lemon mixture (reheat the mixture before brushing). Sprinkle the body of the lamb with the lemon zest and sugar mixture. Bake at 350 for 20-25 minutes. Drizzle citrus glaze.